The US economy is running at full steam according to the latest data released today. This helped push the dollar firmly higher against most of the majors including euro, sterling, Japanese yen and the Swiss franc. 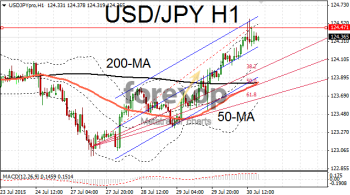 The benchmark US dollar index posted its strongest gains in two weeks extending the rally into three. 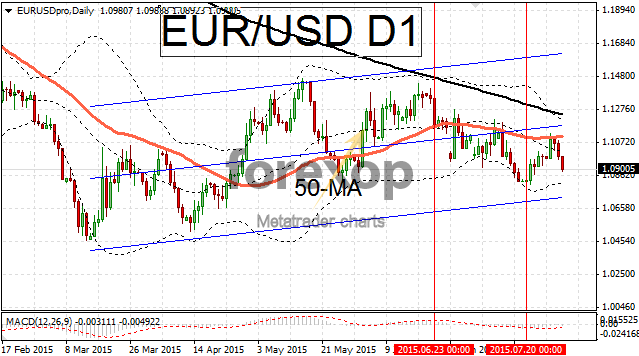 EUR/USD broke down below 1.10 after failing to carry forward on a rally that started at the beginning of last week. Bearishly, the pair has been trading below the 50-day moving average for over one month. The euro is not seeing enough buying interest to breach resistance at that barrier. 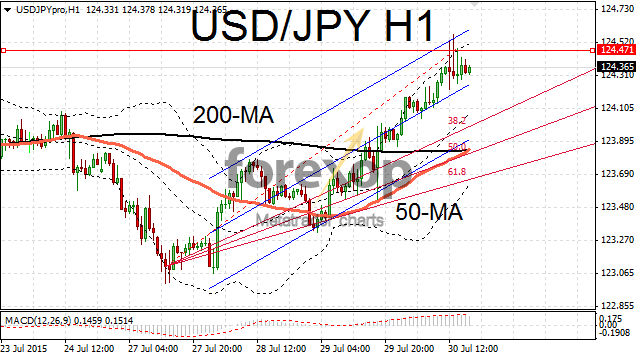 USD/JPY powered upwards to 124.36 on the stronger dollar in doing so maintaining the upwards momentum. The rally has taken the greenback upwards by over three percent since the low of 120.39 at the start of the month. The pair is feeling resistance at 124.47. A breach of this level could see the pair testing the recent highs seen in June around the upper 125 range. The latest batch of figures helped reassure markets that the US Federal Reserve will remain on course to raise rates during the latter part of the year. This gave a decent boost to the greenback and lifted treasury yields as markets consolidated their view that a September hike is probable. The US economy was far stronger in the first quarter than was originally estimated according to the most recent data. Early indications were that the US economy underwent a mild contraction in Q1. This was feared to have been a “knock on” from bad weather and the West Coast port strike. The latest revised figures from the Department of Commerce showed that growth in Q1 was 0.6%. The upward revision brings annualized growth for the US economy up to 2.6% pa.
Growth in the second quarter was estimated to be 2% which beat analysts’ forecasts by 0.5%. Consumer spending rebounded strongly in the second quarter helping the robust expansion. Core personal spending rose by 1.8% against 1% in the first three months of the year. The latest jobs figures were also reported separately by the US Department of Labor. Initial claims fell last week to 267,000 beating the consensus estimate by 4,000. By contrast data from the Eurozone was mixed. In Germany inflation fell unexpectedly in July. Today’s preliminary estimate showed the consumer price index fell to 0.2% pa. The harmonized index (core inflation which removes food and energy) stood still during the same period. The labor market also took a knock after figures released today showed a rise of 9,000 unemployed. Markets were looking for a reduction of 5,000 out of work claims.